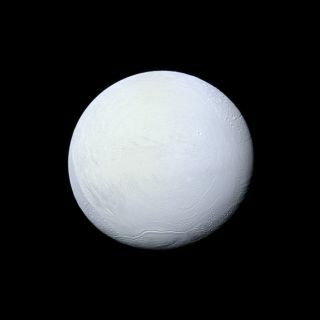 Saturn's moon Enceladus, covered in snow and ice, resembles a perfectly packed snowball in this image from NASA's Cassini mission released on Dec. 23, 2013. This view was taken by Cassini on March 10, 2012. It shows the leading side of Enceladus. North on Enceladus is up and rotated 6 degrees to the left.